This command deletes all records from table. Truncate is a DDL command. The ORDER BY clause arranges the table or column in ascending or descending orders. By default, it is ascending order. ‘ASC’ used to indicate ascending order and ‘DESC’ used to indicate descending order. To appear the resulting records randomly Rand() method used in MySQL. Here, output is the same. Limit keyword is used to retrieve finite number of records. Limit can be used with one parameter or two parameters. This parameter decides number of records to display. 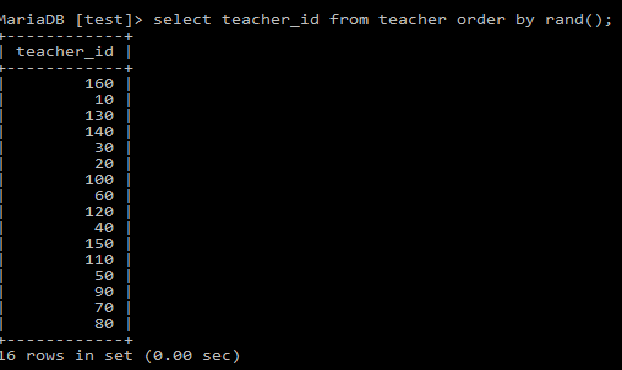 Here, first parameter indicates number of records to skip and second parameter indicates the number of records to display. The GROUP BY clause used to club together rows who have same values. Mainly GROUP BY clause used with aggregate functions to produce a summary reports from database. The having clause is used in conjunction with aggregate functions instead of where clause. It does not mean where clause and aggregate functions are not possible in same query. We can use where clause and aggregate function in same query. Note: Having clause applies on group of records, on the other hand where clause is applied on each single record. Where and having clause can be used in same query. 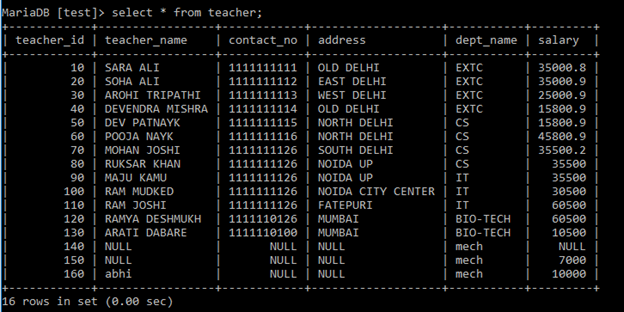 Example: Write a query to display department name with their head, and how many teachers are working in respective dept. Join returns the match values from both table with respective of ON condition. 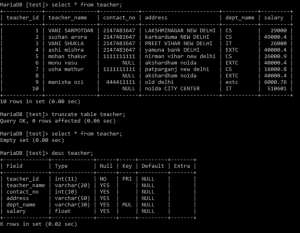 SQL Right Join returns all the records from right table and matched values also. If there is no matched values in other table, it will return null. SQL left join returns all the records from left table and matched values. If there is no matched values in other table, it will return null. View is same as a table in a database. Table is a physical entity while view is not. 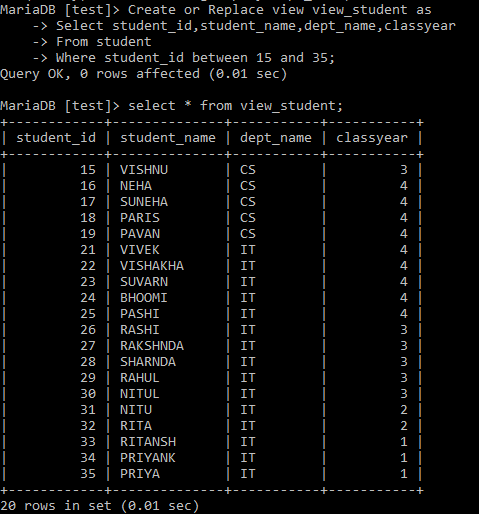 View is a virtual table based on result set of SQL query. 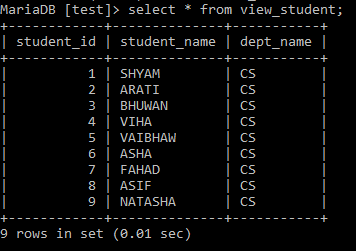 User can create view by writing SQL queries using one or more table which means, view can contain columns/field/attributes from different tables. Following output screen shows that a user can perform SQL functions on view when data present in view is from single table. It is also same in case of WHERE and JOIN. In a replace view, user can change view name or contents of view by changing query inside view. User can drop view using DROP VIEW command. Query within another query called nested query. User can refer them outer query and inner query. Inner query named as subquery. Subquery can results in a single row output or multiple row output. User can put subquery in front of select or where clause. Q1 Display teacher names from ‘IT’ department whose salary is greater than average salary of ‘IT’ dept. In MySQL, AUTO_INCREMENT keyword is used to generate a sequence. It generates sequence of numeric values which is used to identify each record uniquely. When this is applied on column, it increments column’s value by 1 while inserting a new record into table. Auto_increment field should be a key. User can create index. Data is retrieved very fast from database with the help of index. User is not able to see index. Index is used only in searching or querying purpose. Q1 Find out highest salary from the teacher table on the teacher_id basis. Q2 Find out second highest salary from the teacher table on the teacher_id basis. Q3 Find out the third highest salary from the teacher table on the teacher_id basis. Q3 Find out the nth highest salary from the teacher table on the teacher_id basis.